Following the destruction of Bobby's house by the leviathan Edgar, he tells Sam and Dean that he had copies of many of his books stashed around the country. On their next case, involving Osiris, Bobby does research from a storage unit. he has a desk, chair and lamp in the middle, as well as many books, and jars and containers which may contain elements required for spells. It is later emptied of its books by Jody Mills which Sam uses to identify the god Chronos and they come into the possession of Sam and Dean. Its unknown if there is anything left inside or if it's even still currently owned under Bobby (or one of his aliases). The storage unit is No. 032. Bobby researches Osiris from books in the storage unit. Sheriff Jody Mills packs up Bobby's storage unit and brings the boxes to Sam in Canton, Ohio so that they can research Dean's disappearance. There are over twenty boxes, and Jody speculates that Bobby "may have had a slight hoarding issue" as she barely got the door open and that "something is alive in at least three of those boxes." Amongst the books and papers there is also a bottle of scotch from Rufus which Bobby won in a bet. Sam uses a copy of one of Bobby's books to identify the Infinite Hourglass, the mark of Chronos, the god of time. It's revealed that Bobby won the bottle of scotch from his storage locker in a bet with Rufus in regards to the creature they were hunting. Rufus had insisted that it was baku while Bobby insisted that it was something else. 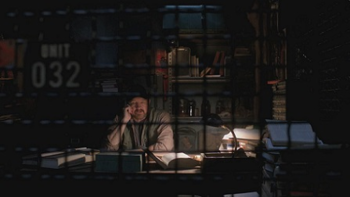 After the creature is proven to be a Soul Eater, Rufus leaves the bottle and note on Bobby's front seat but he never gets to open it or finish his journal entry on the case as Dean calls about a lead on Lilith. This page was last edited on 18 February 2019, at 07:01.